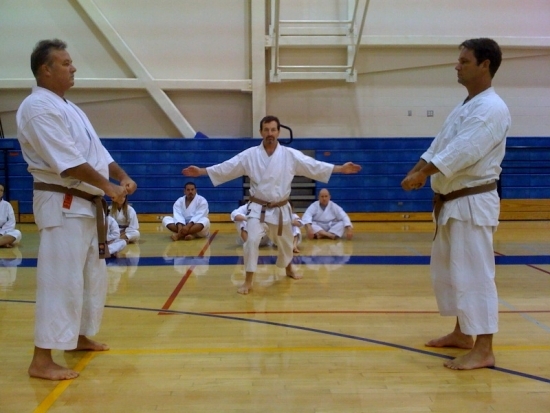 A fantastic event of alternating, advancing rounds of ki-tei (please go to the ki-tei page for a description) and kumite. The final match is always kumite. From the final match the alternating rounds are calculated backwards to determine if the first match will be a kumite match or a ki-tei match. If for instance the first match is determined to be kumite, then the winner of that match would advance to next round facing the winner of another kumite match. In the next advancing round they would both perform ki-tei. Winner to be determined by flag system. These alternating matches (winners advancing loser dropping out) would continue till a final two winners would meet for a final kumite match. 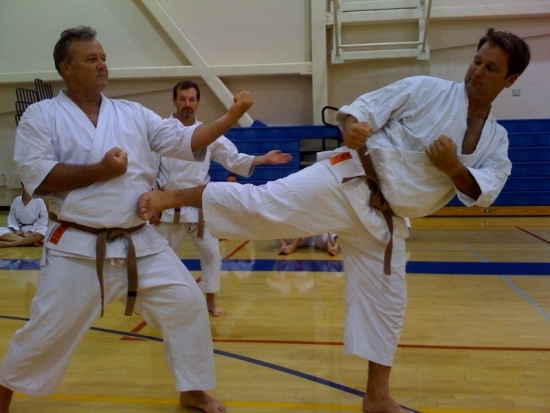 The concept is to encourage a well rounded karateka. Not just in kata or kumite, but in both. 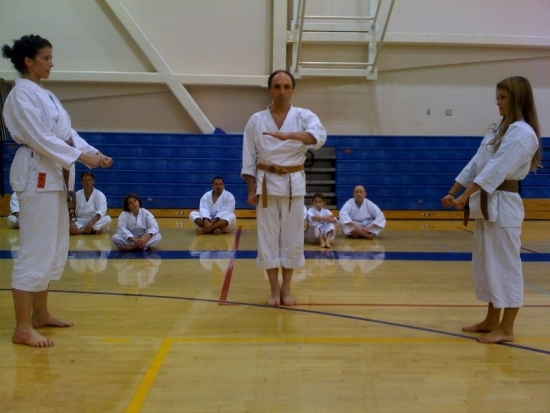 In this photo at Nishiyama sensei's Central Dojo in Los Angeles, Californis USA (1440 Olympic Blvd) just before traveling down to La Jolla, San Diego for his ITKF International Summer Camp, where he will introduce Kitei and the concept of Fukugo for the very first time to international organizations, instructors, competitors and general karatekas.